One-stop shopping for all the latest Chandra materials available. Inspirational quotes with spectacular astronomy images. 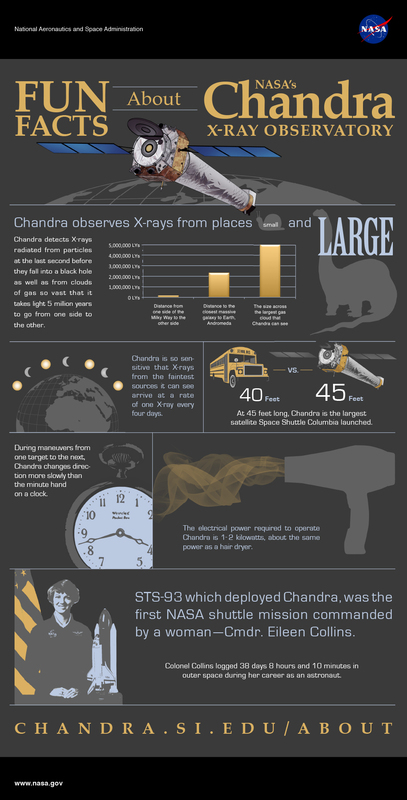 Fun Facts About NASA's Chandra X-ray Observatory. Print your own 2018 Chandra calendar with spectacular images from the past year. Science enrichment for Grades K-6 covering light, stars, speed, mountains and rotational inertia. From Volcanoes to Supernovas, for high school audiences. Science Olympiad is a national non-profit organization dedicated to improving the quality of K-12 science education, increasing interest in science for all students. The familiar periodic table of elements has been adapted to show how astronomers see the chemical Universe. An activity that uses Chandra data to investigate several supernova remnants to determine if the supernova was a Type II core collapse or a Type Ia thermonuclear event. This online exhibition explores the research processes used by art conservators and astrophysicists, featuring X-ray images of the cosmos from NASA's orbiting Chandra X-ray Observatory and X-ray images of modern paintings from the Harvard Art Museum. A panoramic X-ray view, covering a 900 by 400 light year swath, shows that the center of the Galaxy is a teeming and tumultuous place. Space Math @ NASA introduces students to the use of mathematics in today's scientific discoveries. Astronomers have built telescopes and detectors that can see far beyond the type of radiation we can detect with the human eye. Animations in high definition viewable on your computer or television. Explore these interactive images by turning on and off the different kinds of light incorporated into the composite. In 1999, the most powerful X-ray telescope ever made began its exploration of the hot Universe. Explore the highlights of the Universe with Chandra. This series of posters represents some of the most dramatic images made by combining data from the best of modern telescopes. A side by side comparison of images of Earth by Yann Arthus-Bertrand and images taken by Chandra. Scroll through the entire library of released Chandra images in a quick-downloading 3d wall format with the Cooliris plug-in for Firefox, Internet Explorer and Safari web browsers. Chandra 101 provides information about topics pertaining to the Chandra X-Ray Observatory. Many sections contain links to more detailed information. Multi-wavelength astronomy - the study of the universe at wavelengths beyond the visible, has revolutionized our understanding and appreciation of the cosmos. Explore the universe by shrinking cosmic scale in 4 steps (Audio & American Sign Language). Most of the Universe is dark. How can X-rays help reveal the secrets of this darkness? Now you can take Chandra anywhere, be it school, work or play. Just download Chandra Podcasts to your portable MP3 player and go. Winners of the Chandra-Naming Contest. Subscribe to the Chandra RSS feed for the latest news. Fill up your wide screen display with our newly-formatted desktops. Ask the questions that you have about Chandra and Chandra's Missions. A detailed site map helps you explore chandra.harvard.edu, includes Top 5 Questions.